The Aqua Lung MK 2 is the core layer of the Glacier layering system. 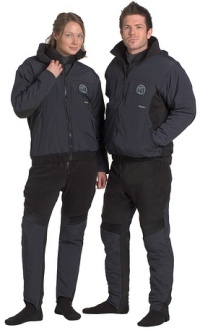 Extremely versatile, this garment can be layered up and down to match the widest range of diving conditions. Removable sleeves on Jacket & John. Complement this system with the MK1 or MK0 one piece thermal layers for colder conditions. Thumbloops on John & Jacket. StormShield face guard with fleece liner. 1mm Lycra/neoprene 2-way stretch expansion panels at waist and above knees in john for optimal mobility. 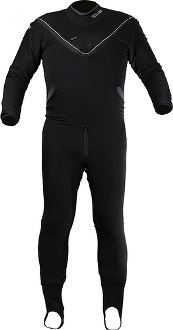 Patent pending Thermal Core Technology is a unique, dual layer design, that allows the diver an unlimited range of motion, with a streamlined fit. The first layer, a loose cut thermal core constructed of Polartec 200 fleece, fits a wide size range and does not restrict mobility. The second, outer layer, is a Polartec Power Stretch Pro compression skin which streamlines the inner core to the divers body, provides a custom fit, and allows maximum range of motion. Polartec Power Stretch Pro compression skin, combined with Whites unique ATS (Air Transfer System) minimizes buoyancy, while allowing incredibly efficient air venting out of the suit. Constructed using top grade Polartec Powerstretch Pro and Polartec 200 classic fleece.